Tannins are relatively large phenolic polymers that derive from the polymerisation reaction of phenolic monomers. Their reaction with glycoproteins present in saliva determines the sensory sensation of astringency. They are present in all the solid parts of the grape (skins, seeds and stalks), flow into the must during the maceration phase and end up in the wine. The CDR WineLab® method aims to monitor the concentration of tannins in wine in order to monitor the evolution of these both during alcoholic fermentation and during the micro-oxygenation phase. The reference method used for comparison (Ribérau-Gayon and Stonestreet 1966) is based on the hydrolysis of these compounds in an acidic environment (Bate-Smith reaction) which releases highly unstable carbocations which precipitate in the form of brown-coloured polymers. The reference method is very complex and requires the sample to remain in a bain-marie at 100°C during the reaction. The reaction time is 30 minutes. Optimisation of the CDR method reduces reaction time to just 5 minutes using a microwave. So the CDR WineLab method® optimises the reference method because it reduces the analysis time and is very simple to perform directly in the winery. In addition, the CDR WineLab® method® optimises the reference method for repeatability: the standard deviation ranges from 0.13 g/L with the reference method to 0.07 g/L with the CDR method. The determination of tannins is part of a broad analysis panel developed by the CDR laboratories, implemented on CDR WineLab®®, which offers the oenologist a precise and accurate control of both the polyphenolic extraction phase in red wines (maceration), and the subsequent phase of polyphenolic stabilisation (and therefore of colour stabilisation) that occurs with the micro-oxygenation process. 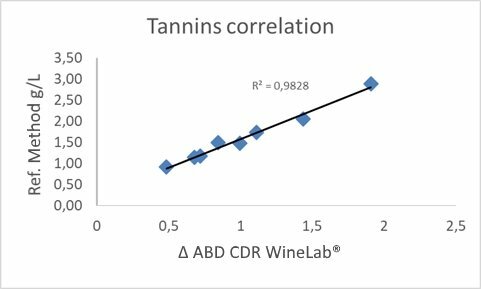 The correlation curve of the determination of tannins in wine and must with CDR WineLab®, carried out with respect to the reference method Ribérau-Gayon and Stonestreet 1966. The method developed by CDR for the determination of tannins is aimed exclusively at the category of condensed tannins. Normally, the concentration of condensed tannins ranges from approximately 1 to 4 g/L. The CDR WineLab® method is based on the hydrolysis of tannins in an acidic environment (Bate-Smith reaction) which releases highly unstable carbocations which precipitate in the form of brown-coloured polymers when exposed to high temperatures. For this reason the CDR WineLab® method involves using a microwave to heat the tubes inside which the tannin hydrolysis reaction takes place. The 520 nm precipitate reading performed with the CDR WineLab® instrument is directly proportional to the concentration of tannins in the sample, which the instrument returns at the end of the analysis in g/L. Tannins was last modified: February 25th, 2019 by CDR s.r.l.